ROCKVILLE, Md., Dec. 27, 2006; Some New Year's predictions are, tragically, very reliable. 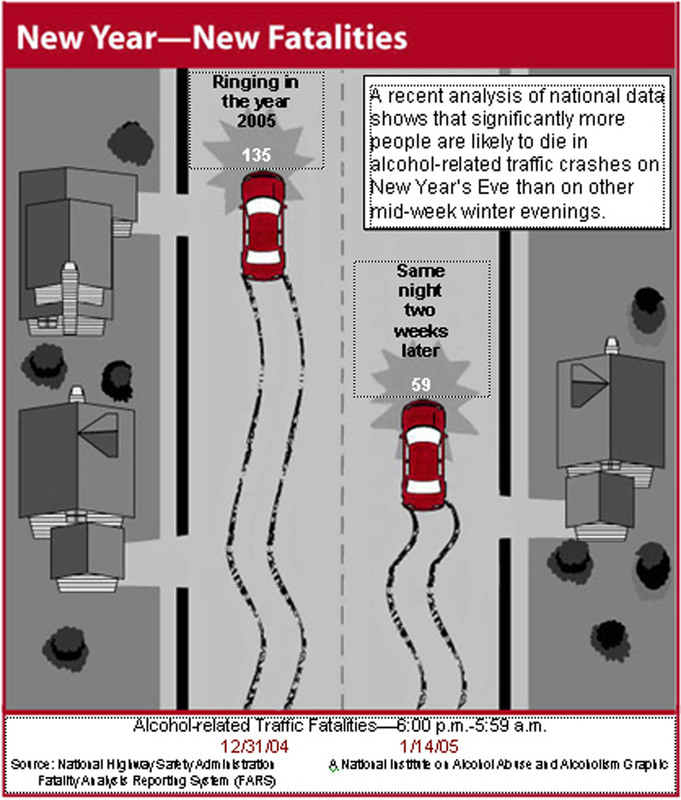 For example, significantly more people are likely to die in alcohol-related traffic crashes on New Year's Eve than on other mid-week winter evenings. Just look at the numbers. 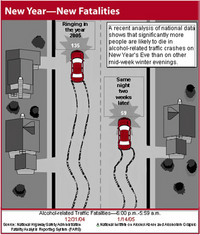 A recent analysis of National Highway Traffic Safety Administration statistics shows that, by the time our country finished ringing in the year 2005 (the last year for which data are available), 135 people had died in alcohol-related traffic crashes in the 12-hour span between 6:00 p.m. on New Year's Eve and 5:59 a.m. the next morning. Two weeks later, on the same night of the week, the death toll dropped dramatically to 59. Even though many of us are aware of the higher rates of alcohol-related traffic fatalities on New Year's Eve, myths about drinking and driving persist -- myths that, for some, can prove fatal. Scientific studies supported by the National Institute on Alcohol Abuse and Alcoholism (NIAAA) on how alcohol affects our brains and bodies provide important information that challenges these commonly-held -- but incorrect -- beliefs. These myths are related to how quickly alcohol affects the body and how long these effects can last. Myth: Drink coffee. Caffeine will sober you up. to normal. There are no quick cures -- only time will help. Many New Year's revelers get into trouble because they generally do not recognize that critical driving-related skills and decision-making abilities are diminished long before they begin to show the obvious physical signs of intoxication. Initially, alcohol acts as a stimulant and if you drink you may temporarily feel upbeat and excited. But don't be fooled. Inhibitions and judgment are soon affected, increasing the chance of making reckless decisions behind the wheel. As more alcohol is consumed, fine motor skills and reaction time begin to suffer and behavior becomes poorly controlled and sometimes aggressive, compromising driving abilities even further. Continued drinking can lead to the slurred speech and loss of coordination and balance that we typically associate with being "drunk." At higher levels alcohol acts as a depressant, which causes people to become sleepy and sometimes pass out. During a night of drinking, it's also easy to misjudge alcohol's lasting effects. Many revelers believe that they can drive safely once they have stopped drinking for the night and have had a strong cup of coffee. The truth is that alcohol continues to affect the brain and body long after the last drink has been downed. Even after someone stops drinking, alcohol in the stomach and intestine continues to enter the bloodstream and circulate through the body. As a result, judgment and coordination can be impaired for hours after drinking. Driving home late at night is especially hazardous because natural drowsiness is magnified by the depressant action of alcohol. Driving abilities may even be impaired the next day, when any alcohol remaining in the system, or the general headache and disorientation associated with hangovers, contributes to the general feelings of sluggishness, even though the person no longer feels "drunk." No one intends to harm anyone when they get behind the wheel on New Year's Eve. Yet traffic fatalities persist and myths about drinking live on -- even though scientific studies have documented how alcohol affects the brain and body. Because individuals are so different, it is difficult to give specific advice about drinking. But certain facts are clear -- there's no way to speed up the brain's recovery from alcohol and no way to make good decisions when you are drinking too much, too fast. On an evening like New Year's Eve (or any other evening, for that matter), rapid consumption of large amounts of alcohol is especially dangerous. So this New Year's Eve, do not underestimate the effects of alcohol. Don't believe you can beat them. Pace yourself and be aware of how much you've consumed throughout the night. And as you think about the consequences of an arrest or a potentially fatal traffic crash, make alternative plans to get home safely.